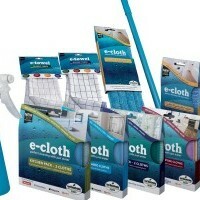 E-cloth is a suitable and affordable alternative to harmful chemicals and sprays. Hence, it is preferable to use this cloth for cleaning purpose ahead of other chemical cleaners. The latter could pose severe risk to yours as well as your family’s health. Are you tired of using regular soaps and detergents to clean your household utensils? Are you still longing to getting the results you are expecting from your soaps? If so, then it is time for you to move on to some different product. Quite often, using different chemicals as cleansing agents has cause some serious health issues or otherwise causes allergies to the person in contact to those harmful chemicals. However, you need to worry about such things anymore, since you can opt for e-cloth to meet your requirements with no potential threats. E-cloth is a widely preferred option for various cleaning purposes nowadays. Its high-end technology, which comprises 480,000 fibers per centimeter square helps in deep cleaning of utensils in no time. Unlike traditional cloths it requires little amount of water for cleaning purpose, and is better alternative to expensive chemicals and sprays. While you need to clean up a large surface area, for instance floor or a dirty wall, using an e-cloth with little amount of water is a wise option. It consists of numerous microfibers that help in cleaning the surface by absorbing the dirt and micro particles, and removing them from the surface. They act as a small finger, which grab the dirt and removes them from the roots. This is because microfibers have the capability to attach themselves to the micro dust particles and pull them off their surface. This is how this special cloth helps in achieving clean platform without the use of harmful chemicals. Requires less water; in fact it works the best on dry surfaces. Free of harmful chemicals, and hence do not pose any threat to users or environment. Good replacement of bleach papers thus reducing solid waste. They recognise the no-compromise high quality of e-cloth and are happy to associate their brand name with our cloths.